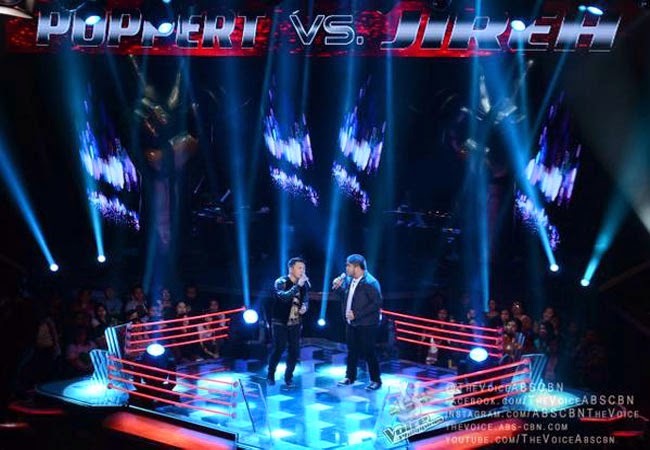 Team Sarah's Poppert Bernadas vs. Jireh Singson will happen in the final Battle Rounds on Sunday, December 21,2014 at 8:30 PM in The Voice of the Philippines Season 2. The four chair turner, Poppert Bernadas is a 27 year old theater actor who had dedicated his song ‘Luha’ to his mother who is currently in need of dialysis. He was part of the musical ‘Rock of Aegis’ that present the songs of Aegis in a story. Lea was surprised to see him. Sarah then invited Lyka Gairanod to sing a duet with him and convinced hom to be in her team. Jireh Singson had grown up as a pastor’s child with passion for music. Jireh had swayed toward vices such as smoking and drinking while in a band. He was able to go back to his path of ministry after his younger sister who was a special child passed away. Singing ‘Makita kang Muli’, he was able to secure a spot on te battle Rounds. Who among them will survive and get to Knockout rounds? Bookmark and reload this page to find out.